When you buy a new laptop or computer, it runs like a powerful machine. Over a period of time, your laptop or computer gets overloaded with software's, documents, music, videos, games, and yes with viruses and spywares too. These things make your system slow down. You must be thinking, How to increase computer speed just like the speed you were getting when you bought it. If you maintain your system and do the following task regularly, then not only you can improve your system performance but also you can save huge bucks from buying a new laptop or computer. In this article, I will show you some tips to keep your system healthy & fast. Disk Cleanup utility is an excellent utility to perform a disk cleanup and to get rid of recycle bin, temporary internet files, system logs and other temporary files that consume system memory. Disk Cleanup activity can be slow for the time being when it starts cleaning temporary files, thereafter your systems speed will definitely improve. Step-1: Go to Start > RUN > type cleanmgr and hit Enter to open Disk Cleanup. 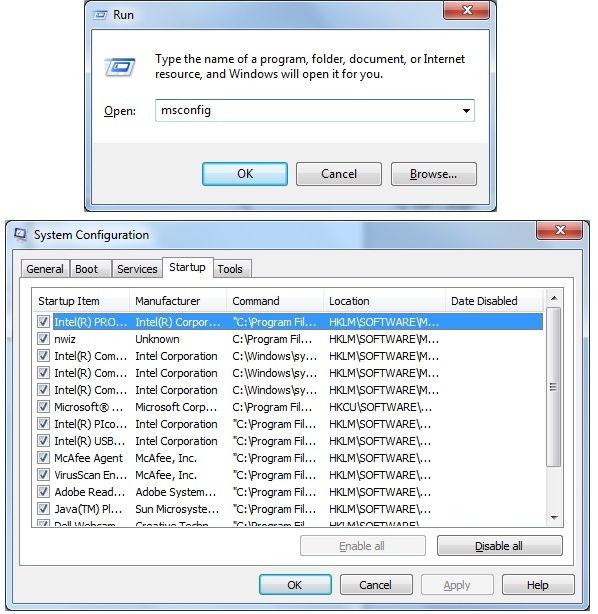 Press CTRL + R to open RUN dialog box > type cleanmgr and hit Enter. Step-3: Now select the files you want delete from your computer. These files are not permanently removed until you empty the recycle bin. Think about your desk where everything is messy and you find difficult to search things quickly. Now assume your desk is cleaned and organized then it's easy to search things quickly. It is the same with our computer, we open several programs and use internet, so temporary files are generated and these files get moved a lot and increase time to find the stuff. Using Disk-Defragmenter utility we can instruct our computer to organize all the files in hard disk that makes it easier to search files. Step-1: Go to Start > Control Panel > System and Security > Administrative Tools > Computer Management. Step-2: Go to Storage under Computer Management > Select Disk Management option. Right click on the drive (like C: or D: drive) which you want to De-fragment and click on Properties. Step-3: Go to Tools Tab and click on Optimize. This optimize and defragment your computer's drives and help it run more efficiently. There are many antivirus software’s available in the market and there are millions of viruses out there who can steal your computer's confidential information, some delete files, some re-arrange files, some completely render your computer useless, and some invade your privacy. In reality no antivirus software is capable of detecting and removing every threat so identify good anti-virus software and update their database information regularly. It helps to identify and remove anti-viruses from your computer. CCleaner is a very powerful tool to remove temporary internet files, log files, temporary files, recent documents, history and recycle bin. After a period of time these files slow down your computer as well as take up space on your hard drive. Microsoft occasionally releases software updates and patches to make the operating system work better and more secure for future threats. They also provide regular updates for some important applications. Note: Always keep your system updated with latest service pack. Running scan disk utility automatically fix errors and marks the bad sector unusable so that the operating system can identify and skip them in future search. Due to these bad sector your system becomes slow. When you install any software or program to your computer, some of them are stored in system's startup items. These software's take more space in RAM and waiting for them to be used. After a long period of time they slow down your computer. So disable all unwanted software's from your system configuration. Step-1: Go to Start > RUN > type msconfig and hit Enter to open Disk Cleanup. Press CTRL + R to open RUN dialog box > type msconfig and hit Enter. Now go to Startup tab and disable unwanted startup programs. Over a period of time, we install so many games, software's in our computer for testing purposes or just for fun. And usually most of us forget to uninstall them. Don't forget to uninstall unused software's or programs from your computer. Best practice is to check your system periodically for unused software's and uninstall them. If you are using Internet Explorer (IE) as your Web browser, it is time to upgrade with Google Chrome or Mozilla Firefox. Download Google Chrome browser and make it as your default web browser. Even you can use Mozilla Firefox if you are not fond of Google Chrome. I love both Google Chrome and Mozilla Firefox. It's my person experience that Google Chrome is faster than IE11. Sometimes heavy Visual effects like animation, shadow, fade or slides slow down your computer. But don't worry you can also optimize it for better performance. Step-1: Right click on My Computer / This PC > Click on Properties> and then Advance system settings. Step-2: Go to Advanced tab and click on settings under performance options. Step-3: Under Visual Effects tab, click on Adjust for best performance options. Click on Apply then OK. That's it. By this way you can adjust the system for best performance. After implementing all the above solutions, If your system is still running sluggish then you can upgrade your system's RAM of your system. Upgrading RAM in desktop computer is little bit easy than laptop. If you are not able to do it yourself, then take the help of an IT expert. Don't let poor system performance affect your productivity. Use above simple tricks to improve your system's performance at a great extent.